IRS Form W-2g or the "Certain Gambling Winnings" is tax form released and collected by the United States Internal Revenue Service. 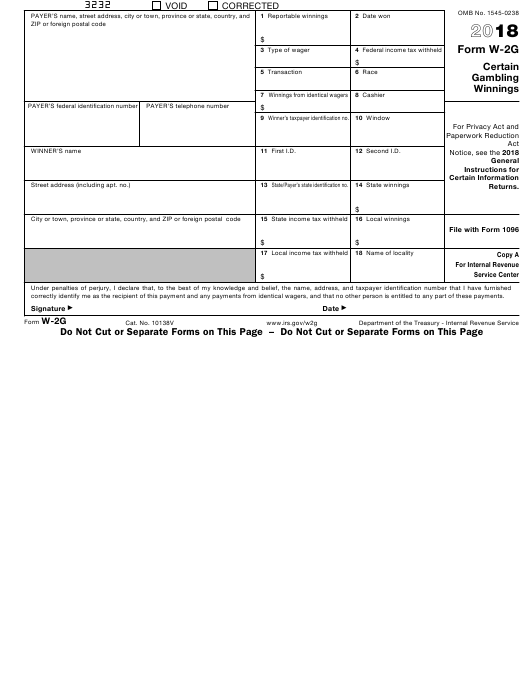 The January 1, 2018 fillable version of the W-2g Form can be downloaded below in PDF-format. The IRS-issued "Certain Gambling Winnings" is available for digital filing or can be filled out through the Adobe Reader application on your desktop or mobile device. correctly identify me as the recipient of this payment and any payments from identical wagers, and that no other person is entitled to any part of these payments. certain winnings less the wager. not provide your federal identification number to the payer. and Estimated Tax, for additional information. payer, who will give you your copies. Deductions, and Pub. 525, Taxable and Nontaxable Income.